Product prices and availability are accurate as of 2019-04-19 06:22:11 CDT and are subject to change. Any price and availability information displayed on http://www.amazon.com/ at the time of purchase will apply to the purchase of this product. Don’t settle for less. Join Patrick on this epic adventure of becoming God’s man. You’ll discover how to prevail in tough times and release God’s power in every area of your life. Q) Pat, you’ve been involved in men’s ministry for over 30 years. What do you see going on with men today that made you want to write this book? A) I love my work, and we are seeing amazing results. Every day we see men coming to Christ and growing as disciples. That said, we need to do a reality check. We live in a counter-Christian pop culture that ridicules men in general and Christian men in particular. 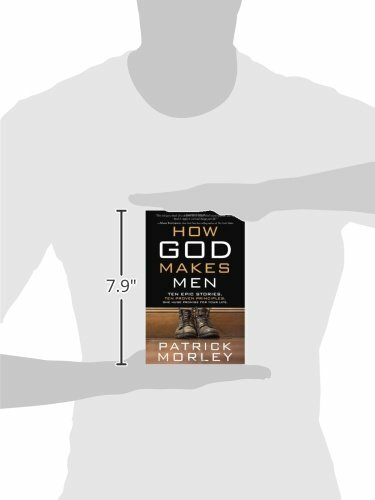 The battle line against biblical manhood is clearly drawn and fiercely contested. As a result, legions of men struggle to sustain what they started and finish the race. It’s as though they’ve enlisted and been issued a weapon that they’ve never learned how to clean and shoot. They’re sitting ducks on the day of battle. That’s what made me want to write How God Makes Men. Q) Why are there so few role models in our culture? Where can men look to find examples of godly fathers, husbands, and working professionals? 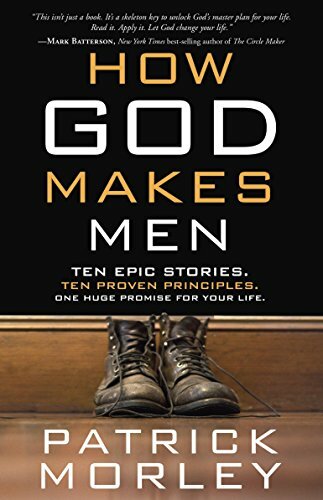 Q) In How God Makes Men, you pick 10 men from the Bible who can serve as mentors to men today. How did you decide which 10 to include? A)I was interested in showing men just how relevant the lessons learned by men in the Bible are to them today. 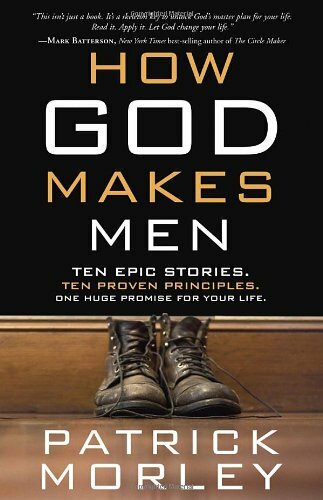 So I picked 10 men who are particularly relevant for today and developed 10 highly desirable principles about biblical manhood from their lives. How did God mold and mobilize these men? What were the obstacles they faced? What held them back? How did God get them uncoiled? And what was their part? In each of their epic stories, we can see the hand of God at work—shaping them, leading them, making them into the men He always planned for them to become. Q) Which biblical hero is your favorite, and what do we learn from him about living a powerful life? A) Wow! That’s like asking me which of my children I love the most! How about, I love them all equally but for different reasons. From Abraham, we learn about faith—that God makes men by showing us how we can believe Him anyway in the face of what seems like impossible circumstances. Joseph teaches us about perseverance—that God makes men by orchestrating even the toughest circumstances of our lives for a greater good. Moses teaches us about transformation—how God makes men by taking us through a humbling process that fundamentally changes the way we think. From Gideon we learn about real strength—and see that God makes men by turning our weakness into strength in such a striking way that only He can get the glory. The sobering story of David reminds us about discipline—how God makes men by doing whatever it takes to correct and restore us when we go astray. We can turn to Solomon to learn about true happiness—that God makes men by making it impossible for us to find lasting happiness in any pursuit apart from Him. Buddy, well, that’s different. Where Harry softened me up in many respects, Buddy did the opposite, showing me that you have to be tough and committed and completely devoted to your flock. They were some tough lessons to learn, especially given his methods, but I’m glad I had him as my teacher—mostly. From Nehemiah, we learn about how God calls men to action—that God makes men by turning what breaks our hearts into a passionate calling to help redeem some broken part of His world. In the story of Job, we gain insight into suffering—that God makes men by allowing us to gain through suffering what we can gain no other way. When we come to Peter, we learn the compelling principle of discipleship—how God makes men by a process of calling, equipping, and sending us so we can call, equip, and send others. Finally, through the passionate story of Paul, we learn about surrender—that God makes men by forging us into humble servants who are increasingly surrendered to the lordship of Jesus. Q) Why did you include the success and failures from these examples? A) I think God knew that no man would be able to relate to a “perfect” man in the Bible. By showing their flaws, we can see that these men are not so different from us. In fact, after a thorough reading of the Bible, we can conclude that if God didn’t use flawed men, He would have any to use!